Provate collection of MR John Simpson. 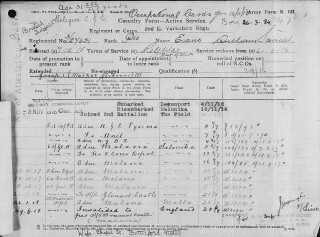 William Evans, service record of dates and locations 1916 to 1920. William Samuel Evans was recorded on the list of Bottesford Absentee Voters, 1918/19, 27651 Pte, 2nd East Yorks, and his address then was Chapel Street. William Evans was born in 1884 at Gretton, Winchcombe, Gloucestershire, son of John Evans, a shoemaker born in 1844 in Gloucestershire, and Mary Evans, born 1846 at Teddington, Gloucestershire. They had three sons: John (born 1874, a “labourer in fruit plantation”, Albert (1880) and William (1884). 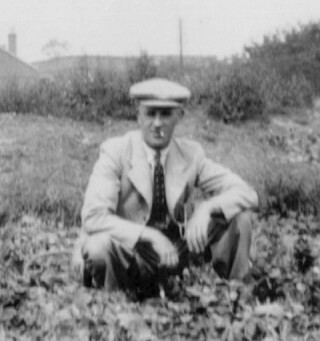 In 1911, William was boarding at the house of Henry and Mary Ann Bailey, Belvoir Road, and was employed as a gardener at nursery located on Belvoir Road, latterly ‘The Vineries’. The nursery was then owned by William Arthur Robinson. William Evans first joined up at Leicester, on 6/6/16, aged 32, as 27651 Private, 3rd Battalion, East Yorkshire Regiment. He lived on Chapel Street, where his wife lived while he was away. His employer was W Robinson, The Vineries, Belvoir Road. William Evans was based at Salonika from November, 1916, to January, 1918. His service was marked by repeated attacks of malaria, which resulted in three spells in hospital. Transferred to 2nd Battalion, East Yorkshire Regiment, probably in 1917. Treated at 63rd General Hospital, Salonika, August-November, 1917, for malaria. Treated at St Andrews Hospital, Malta, June-July, 1918, for malaria. Ship ‘Braemar Castle’ to England, 28/6/18. Treated at Netley Hospital, UK, July-September, 1918, again for malaria. Transferred to Army Reserve Class Z, 1/10/1919. 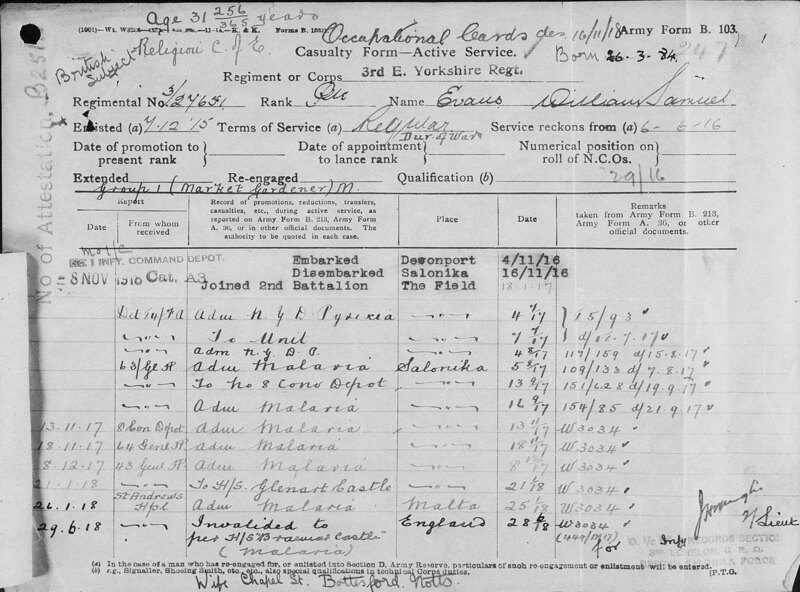 William Evans was demobilized, 23/8/1920. After the end of the war, William and his wife Edith lived in a house on Chapel Street, as indicated by the Electoral Rolls from 1921 to 1930. Later, they lived in one of the terrace called Butcher Row, located on the southern side of High Street, where Hands Walk is today. He was an ARP Warden during World War 2, on duty at their post on top of Palmer’s Hill (Beacon Hill). He used to go up to the top of Palmer’s Hill with Ernest Jallands at night for the Observer Corps, and always took a truncheon with him. The Evans’ house was the only one in the row (Butcher Row) with a slight bay window. It has been remembered that his house was one that suffered the attentions of village children. They attached cotton reels to the door with a string, pulled the string and then ran! William Evans died in July, 1961, aged 77. His obituary in the Grantham Journal mentioned the following details: He had lived in Bottesford for over sixty years. When he was young he worked for Mr W.A. Robinson at the Vineries and, until shortly before his death, for Mr F. Baggley. Suffered repeats spells of malaria between 1917 and 1920.